1. 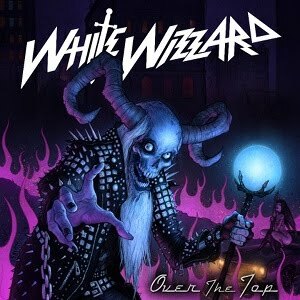 White Wizzard, “Over the Top.” It’s been a great year, but so far nothing has come close to topping this in my opinion. It’s great, catchy, infectious old school fun. Unfortunately the band has once again shifted members since the release, losing vocalist Wyatt Anderson and guitarist Erik Kluiber. We’ll have to wait to see what the future holds. 2. Danzig, “Deth Red Sabaoth.” It may be just because this one is so fresh in my mind, but I’m really digging it right now. It’s back to the roots of Danzig and what I loved about the band in the first place. 3. Overkill, “Ironbound.” Old-school thrash at its finest. Perhaps one of Overkill’s best records ever. 4. Daredevil Squadron, “Out of the Sun.” Much like White Wizzard’s new record, this one is just good, old-fashioned fun hard rock. I love it. 5. Jon Oliva’s Pain, “Festival.” Not as strong as his last outing, “Global Warning,” but it’s still Jon Oliva and still rock solid. 6. Nevermore, “The Obsidian Conspiracy.” Some new elements and some old elements come together here. Not as good, to my ears, as “This Godless Endeavor,” but a top-notch record. 7. Armored Saint, “La Raza.” I was hoping to hear John Bush back with Anthrax. Now it seems that won’t happen. At least we still have Armored Saint, and a new Saint record is always worth the wait. 8. Charred Walls of the Damned, “Charred Walls of the Damned.” Finally, one of my favorite singers, Tim Owens, finds a good home in drummer Richard Christy’s all-star project. Hope they stick around for a while. 9. Shooter Jennings, “Black Ribbons.” I wasn’t sure about this record when it first came out, but over the months, I’ve come to really like it. Trippy and strange, but cool. 10. Fear Factory, “Mechanize.” At long last, Fear Factory gets back to what they’re supposed to sound like. Exodus, “Exhibit B: The Human Condition.” Another hard-hitting album from the new era of Exodus. Kiuas, “Lustdriven.” Not as strong as the work that made me a huge fan of the band, but still a good record. Masterplan, “Time to Be King.” Jorn Lande is back, and Masterplan is back at the top of its game. Jorn, “Dio.” Begun almost a year before Dio died, it will be interesting to hear Jorn’s take on some classic tunes. Soilwork, “The Panic Broadcast.” I actually already have this one in hand, but haven’t quite made up my mind about it. Black Label Society, “Order of the Black.” Can Zakk return to form on this record? The early songs sound promising. Disturbed, “Asylum.” The preachy first single isn’t turning me on, but I liked “Indestructible” enough to give this one a shot. Iron Maiden, “The Final Frontier.” The first song doesn’t impress, but it’s still Maiden, so I have to check it out. Blind Guardian, “At the Edge of Time.” Here’s hoping for a comeback.